Decades after the first, fateful encounters between elite American forces and the extra-terrestrial Predators who hunt humans for honour and sport, Special Forces Captain Quinn McKenna (Boyd Holbrook) encounters a Predator marooned in the Mexican wilderness. 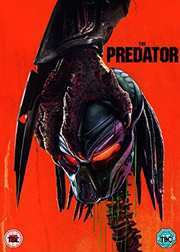 But soon after the captive Predator becomes the centrepiece of a top-secret study under evolutionary biologist Casey Brackett (Olivia Munn), a deadly new breed of Predator arrives on Earth, with plans that could threaten the entire planet's future. Now Brackett, McKenna, his son, and a squad of military misfits have to band together to fend off both the alien threat and a human conspiracy - making surprising allies in the process.